In the beginning stages of your relationship, you cannot get enough of each other! In other words, you could talk for hours about anything and everything. You ask each other dozens of questions, go out on dates, and try new and exciting things together! But that is Stage #1 of most relationships. As your relationship progresses, you enter into a new phase. The love can be deeper, but the effort to continue bonding may dwindle. You need to put in the time and the effort to keep your love fresh and alive! 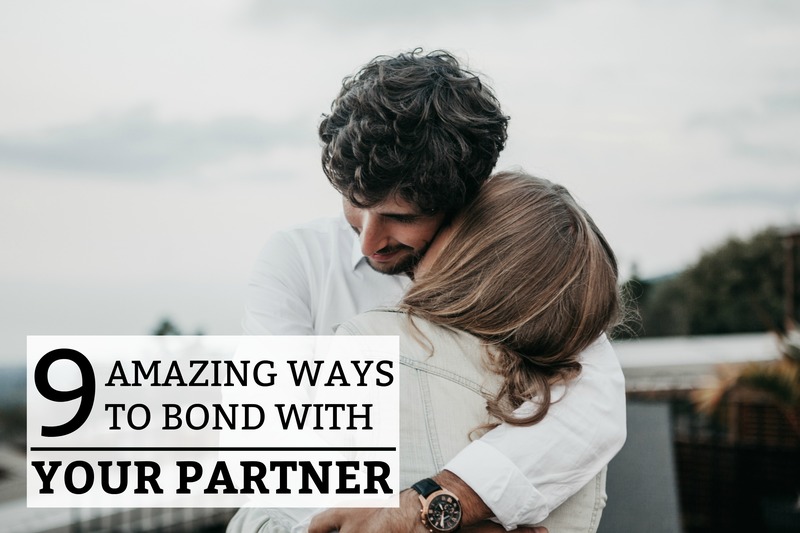 Below are 9 amazing ways to bond with your partner. We live in a world where your phone can dominate your life! You get sucked into an electronic world and miss out on so much of life that could be happening right before your eyes (if you’d take the time to look away from your phone). Put your phone in another room or turn it off! Don’t have it within arms reach because sometimes it is a habit to pick it up and look at it. Then, give your partner your undivided attention. Ask them questions about their day and try to LISTEN and have a meaningful conversation. Try to do this EVERY SINGLE DAY! Otherwise, your partner may start to feel like they aren’t your priority. Your phone is. It’s a simple habit that can make a world of difference in your relationship. If you have never heard about “The 5 Love Languages”, you absolutely need to make this a part of your life. It doesn’t have to be a lavish vacation! It can be a day-trip or a little weekend vacation. If you are trying to stick to a budget, this article will help you plan an affordable vacation! Go online and search for some fun things to do on your travels. There is nothing like sharing new experiences to breath some life back into your relationship! Plus, a little vacation is a time to pause – and focus 100% on each other. Couple’s therapy can actually help you grow much closer. A relationship counselor can show you how to talk through problems, communicate better, fulfill each other’s needs, and strengthen your bond. If anything, it will help to prevent future problems in your relationship! It is so much better to be proactive, then to wait for when your relationship is suffering to go to therapy. Just a few sessions can go a long way. Then, after each session, go out for a treat! Reward yourself for a job well done. Life gets so busy that often, we forget to celebrate the little successes. Whether you or your partner accomplished a small goal, got a raise, received some good news, or just had a good day! Go out for a dinner date or an ice cream cone! Stop waiting for the major accomplishments to happen before you celebrate life. You deserve to celebrate every success – no matter how small. This will take some effort on both your parts, but it will be worth it! Go on Groupon and search for some fun things to do in your area! Maybe this is a cooking class, dance lessons, a couple’s massage, or a sight-seeing tour. Sometimes, we get LAZY when it comes to investing in fun times together. Perhaps you should just start going for evening walks or weekend hikes! Get out of the house and enjoy doing something – anything together! Do everything they like for a whole week! Make their favorite meals, give them a massage or a pedicure, get up early or sleep in on the weekend (whichever they prefer), make them breakfast every day, and treat them like the King (or Queen) that they are! Make them feel like they are the most important person in your life (which naturally they are)! It should be like celebrating their birthday for 7 straight days. There’s nothing like making your partner feel adored and special to keep your bond strong. Indoor games or outdoor games – it doesn’t matter! Playing games together isn’t just for kids. It’s important for adults too! It can help you relax, unwind, and enjoy each other’s company. If you’ve had a stressful day, it will get both your minds off of life an onto something fun and enjoyable. Go online and invest in some board or card games. Sit down, play some games and reconnect and laugh (but don’t get too competitive). The location you got engaged or the park you always use to go when you were dating. Or maybe you always used to go out for icecream once a week. Perhaps you had a favorite restaurant that you only go on special occasions. You and your partner should relive some fun memories and go back to where it all began! Reenact some of your best dates from the past. When the past is full of good memories, bring them back to life and bring back the butterflies!